Aberdaron and its surroundings has been inhabited for thousands of years. Signs of this can been seen in the remains of Stone Age sites, iron age hills forts, burial and standing stones. People have scraped a living from fishing and farming for centuries, with a long maritime tradition and the remains of ancient field boundaries are still to be found. Natural resources, such as Manganese also provided employment into the C20th. In mediaeval times, Christians made their way here along the ancient Pilgrims' Paths from North and South to visit Bardsey Island - Ynys Enlli. Today, we are discovering the wide variety of flora and fauna and our unique land and seascapes offer an attractive destination and we welcome visitors from all parts of the world to share in this very special, remote part of Wales. Welsh is one of the oldest languages in Europe and belongs to the Indo European family of languages. The Welsh are descendents of Celtic tribes who came to Britain in around 600 B.C. During the Roman occupation, the Celts spoke ‘Brythoneg’ and borrowed terms from the Latin including pont/pons, eglwys /ecclesia, ystafell /stabellum which still exist in the modern day Welsh language. There are 29 letters in the Welsh alphabet, including several letter combinations - ch, dd, ff, ng, ll, ph, rh, th - which each represent one sound. As in English, vowels - a, e, i, o, u, w, y - can be either long or short. a, b, c, ch, d, dd, e, f, ff, g, ng, h, i, j , l, ll, m, n, o, p, ph, r, rh, s, t, th, u, w, y.
Sut mae - How are you? 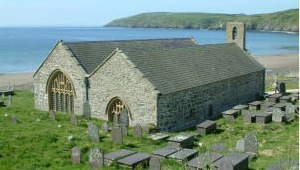 Known as the 'Cathedral of Llyn', St Hywyn's Church stands almost on the beach at Aberdaron. 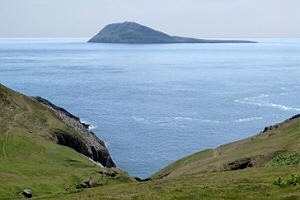 It has a long association with Bardsey as the last stopping point before crossing to the island. Built on the site of an ancient oratory. 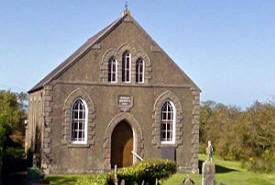 In 1841 the church was abandoned and a new building was erected high above the village. Although the old church was still used as a school, established in 1835, the building as a whole was in a pitiful state. The restoration of St Hywyn’s began and continued over a number of years. By 1868 a new roof was in place and the windows repaired. During this restoration the remains of a number of features were recorded, including a stone bench, a screen and stalls. The oldest surviving parts are Norman. There are two naves, the larger south nave being the more recent one. The new churchyard wall was built in 1997 to curtail erosion from the sea. Pilgrims have come to Aberdaron since mediaeval times, on their way to Bardsey. St Hywyn became Abbot on Bardsey and there are strong links between Bardsey and Aberdaron. 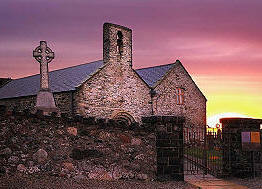 The only church dedicated to St Maelrhys, this single aisled church sits above Porth Ysgo. 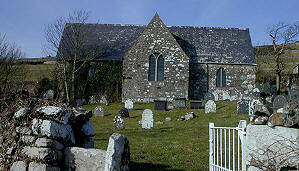 The churchyard is the resting place of the Keating sisters of Plas yn Rhiw and Mildred Elsie Eldridge, wife of RS Thomas. The church stands alone above Porth Ysgo, with Bardsey in the distance. St Maelrhys came to Wales with St Cadfan. The church is simple and plain, with a single chamber. The wooden pews are intact, with box pews on the south side and benches on the north. The oldest parts date back to mediaeval times. There is a 15th century font and an early 18th century Communion Table. The windows were inserted during the 19th century as part of major restorations, at which time the bell-cote was also added. The churchyard is bounded by a stone wall, with steps and a mounting block at the west end of the south wall. 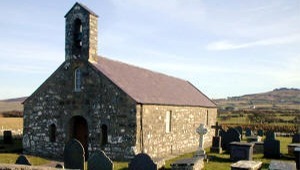 The Parish Church of St Aelrhiw, stands on the eastern side of Rhiw mountain, well to the north of the village. The building has boulder built walls and a slate roof. The structure is of one build, probably in the 18th century but on the footings of an earlier church, perhaps transeptal. The present unusual plan is the same as that described in the earliest terrier, of 1776. It consists of a small nave and a short chancel of equal width, with relatively large transepts or aisles to N, and S. In the E. and W. end walls are indications of earlier openings at a lower level. The roof trusses and furnishing belong to extensive restoration in 1860-61. 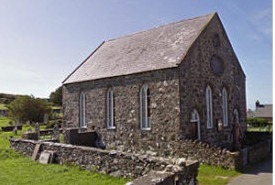 Two of the earliest non-conformist chapels in the Llŷn Peninsula were established at Penycaerau, in 1768, and Uwchmynydd, in 1770, the Congregationalists opened Cephas Independent Chapel in 1829, and Capel Nebo was built at Y Rhiw in 1813, the Wesleyan Methodists followed in 1832 at Capel Pisgah. By 1850 there were eight non-conformist chapels in Aberdaron, five in Y Rhiw and one on Bardsey Island but more were to be built. 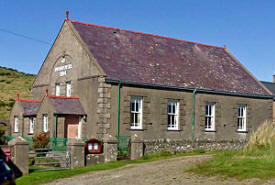 The Calvinistic Methodists opened Capel Tan y Foel and Capel Bethesda, the Baptist chapel at Rhoshirwaun, was built in 1904. Many of these Chapels no longer hold services or are now closed. St Mary's Well is situated on the shore near Ogo Fair, at the foot of Mynydd Mawr. This well is unusual in that at high tide the well is below the level of the sea. It is very dangerous to reach, but at low tide is above sea level, when its waters are 'clear and pure'. A chapel called Capel Mair or Tŷ Fair which was said to have been 'for the use of mariners', once stood at the top of the steps, looking out towards Enlli. 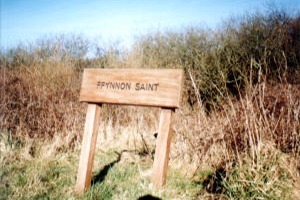 Ffynnon Saint is situated on the roadside just outside Aberdaron on the road to Uwchmynydd. There is still a square of stones and a metal lid covering the well. The stonework that surrounded the well was removed when the nearby hedge was planted. The well is said to be medicinal. The Well of St Aelrhiw is situated in a field across the road from the Church. It is about 10 feet square and is surrounded by a stone wall with a gate and stone seats. 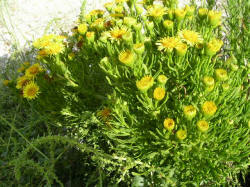 It is said to be particularly effective in curing skin disorders, especially a disease called 'Man Aelrhiw' (the mark or spot of Aelrhiw). Life on Bardsey has always been challenging. 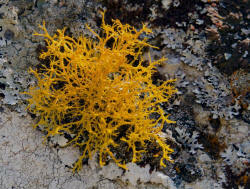 It is separated from the mainland by Swnt Enlli, a channel that is notorious for its dangerous currents. 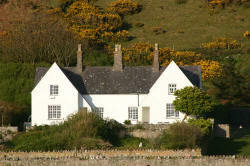 It is owned and managed by the Bardsey Island Trust. 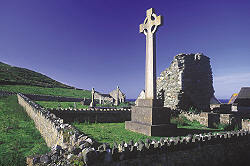 There has been a Christian presence on Bardsey since C6 when Cadfan arrived with a group of monks from Brittany. The remains of the later Augustinian St Mary's Abbey can still be seen. There are many species of seabird that rest, nest or just pass through. The Bardsey Bird and Field Observatory monitor the island's ecology and you can stay at Cristin or one of the Bardsey Island Trust's properties to experience the peace, quiet and tranquillity of this remarkably unspoilt, historically significant little piece of heaven. Today, you can visit by boat from Porth Meudwy with Colin, whose family lives on Bardsey and who has an extensive knowledge of the landscape and wildlife. Crossing to the island is still dependent upon the weather. Pilgrimages along the Northern Route from St Winefride's Well, Holywell to Bardsey are organised through the North Wales Pilgrim's Way - a distance of 150 miles - see their website for details. THESE ARE THE TOMBSTONES of two Christian priests. They were found in the shallow valley of the headwaters of the river Saint, near the farm now called GORS, under MYNYDD ANELOG. The reference to “many brethren” suggests, but does not prove, that the stones came from the cemetery of a religious community, a monastery. They were found in the eighteenth century and it is likely that the old name CAPEL VERACH dates from that discovery. 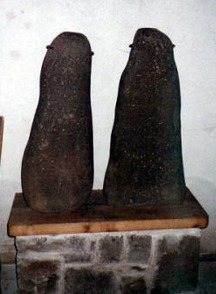 Many years later, the farmer wanted to move them, and to preserve them, they were taken to Cefn Amlwch House and guarded by the Wynne Finch family until, recently, they were brought to St Hywyn’s church, Aberdaron. 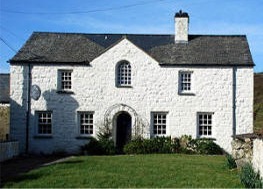 This is a very appropriate home since it is likely that the religious community at Aberdaron was the successor to the one under Anelog and that both had close links with BARDSEY ISLAND (YNYS ENLLI). The stones are two water-worn boulders in their natural state, but the lettering is careful and sophisticated, the abbreviations normal and correct. Notice the angular crossbars of the ‘A’s and the forked serifs*. The men who inscribed these tombstones probably spoke Latin as well as British (forerunner of modern Welsh), and lived within the world of Christian Classical culture. 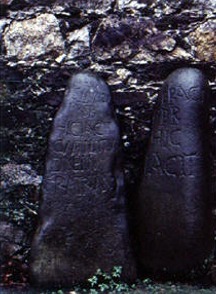 The inscriptions cannot be dated more closely than "late fifth century or early sixth century". The rectangular foundation trench near the present road, under Mynedd Anelog, possibly represents the small chapel known in the Middle Ages as CAPEL VERACH, which may have looked back, in its turn, to a memory of an old sacred site. Please note that the whole site at Anelog, as described, is today on private land. *serif - ‘cross-line finishing off a stroke of a letter’. Manganese was discovered at Rhiw in 1827 and the Mines at Rhiw provided local people with employment from 1840 until well into the 1940s. This metal was used in the steel industry and there was a great call for it during the first World War. Ships berthed at jetties at Porth Ysgo and Porth Neigwl. The ruins of the drum house and adjoining weigh-machine house at Nant y Gadwen These were located next to the marshalling yard and at the top of the final incline leading to the Porth Ysgo pier. Two inclines fed down from the end of the Benallt Tramway above to this level. One of these can be seen clearly behind the drum house. The drum house at the top of it has been demolished. 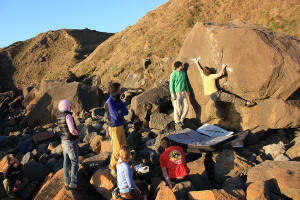 Jasper, a red form of chalcedony, was quarried at Carreg Plas. Granite was quarried at Porth y Pistyll. Limestone and lead were quarried in the village during C19. 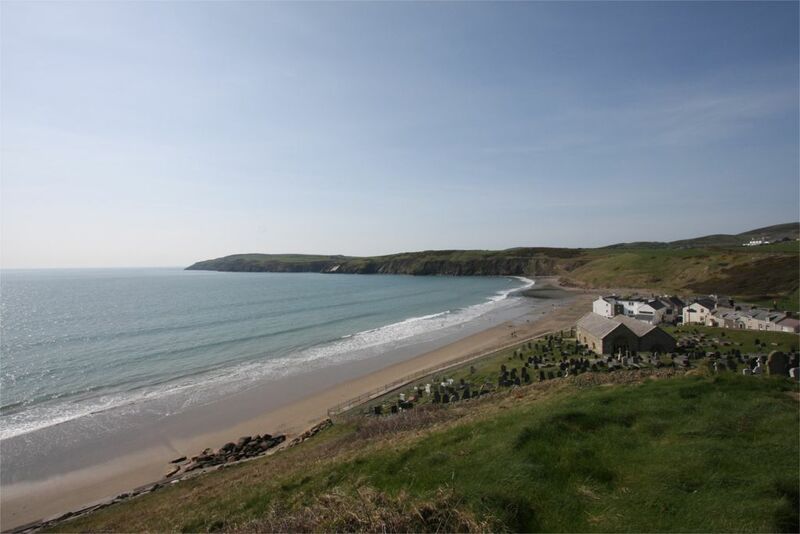 The was a lime kiln on the beach at Aberdaron, where the church car park is now and also on the beaches at Porthor, Porth Orion, Porth Meudwy, and Y Rhiw. The local soil was acidic and quick lime produced by the lime kilns was used to improve the land. In the days before the roads became the major travel routes, the sea was full of ships of all sizes carrying cargoes to and from the Llŷn. 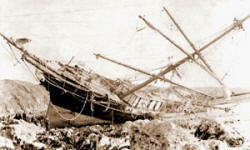 The dangerous tides and rocks around the coast were notorious and many lost their lives at sea. 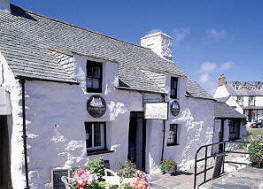 The last ship to be built at Aberdaron was the sloop Victory in 1792. Smuggling was part and parcel of life on the edge, with wrecks providing loot and the impossibility of policing the rugged coast offering opportunities to avoid customs officials. A wonderful collection comprising pages of atmospheric old postcards and photographs as well as histories, census records and much more information can be viewed at www.rhiw.com. A further excellent resource of pictures, photos and stories can be found at www.cimwch.com. The Llŷn Peninsula has a wealth of flora and fauna on land and sea covering a wide range of habitats to excite the natural history enthusiast. To get a real feel for the Gwynedd sea and coast, one of the best places to visit is Uwchmynydd. Standing on the headland at the very tip of the Llŷn Peninsula, you are in no doubt about the power of the sea, the resilience of the cliffs, and the value of the coastal heaths for key birds such as the chough and stonechat. What is hard to grasp is the richness of the awe-inspiring wildlife that lives beneath the waves. Buzzard, Chough, Curlew, Fulmar, Gannet, Great Black-backed Gull, Guillemot, Razorbill, Heron, Herring Gull, Jackdaw, Kittiwake, Manx Shearwater, Oyster Catcher, Peregrine Falcon, Puffin, Sand Martin, Shag, Cormorant, Raven, Waders, and miscellaneous summer visitors and many garden birds. Mammals including Atlantic Grey Seals, Porpoises, Bottlenose Dolphins and Common Dolphins. Lady’s Bedstraw; Wild Carrot; Kidney Vetch; Sea Beet; Rest Harrow; Bird’s Foot Trefoil; Mayweed; Lavender; Thrift; Yarrow; Harebell; Common Mallow.